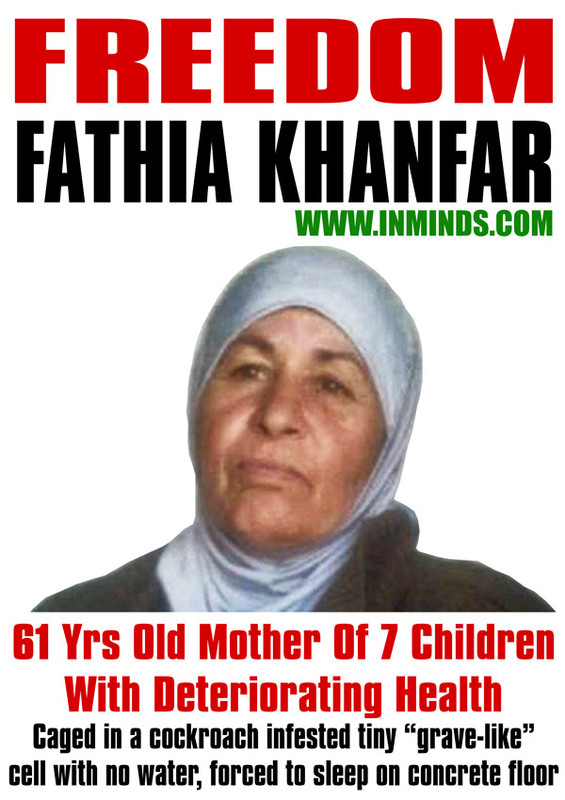 Last month an Israeli military court sentenced 61 years old elderly mother of 7 children, Fathia Khanfar to 11 months imprisonment after having already caged her for 18 days followed by 9 months of house arrest and a £5000 fine. She had been abducted with her two grandchildren aged 7 and 8 years old whilst on her way to see her son Rami in prison, the occupation accused her of trying to bring a sim card for her son to use to phone her from prison. They caged her at Al-Ramla prison with Israeli prisoners convicted of drug-related crimes who taunted and abused her. She was locked up in solitary confinement in a cockroach infested tiny cell with no ventilation which she describes as "grave-like". She was forced to sleep on a concrete floor with just a very thin mattress. 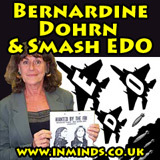 She had no access to water or a toilet in the cell. When her lawyer was finally allowed to see her last week he described her condition as very serious, she is suffering from foot and back pain and infection of the trachea. She already has a heart condition which her unbearable living conditions is exacerbating. Israel has adopted a systematic policy of medical negligence regarding Palestinian prisoners, a study conducted in 2008 revealed that 38% of Palestinian female prisoners suffer from treatable diseases that go untreated. Since a few days ago Fathia Khanfar has finally been moved from that hell-hole, only to be caged in another dungeon, Israel's notorious G4S secured HaSharon prison. Her daughter Sana has stressed the need for immediate intervention for the release of her elderly mother whose health is deteriorating, she has also denounced the lack of action by the PA on behalf of her mother. Its imperative that international pressure is applied to demand the immediate release of Fathia Khanfar. Please join us outside the headquarters of the British security firm G4S which secures many of Israel's prisons including HaSharon where Fathia Khanfar and 24 other Palestinian women are caged, as we demand freedom for Fathia Khanfar and the other women prisoners. 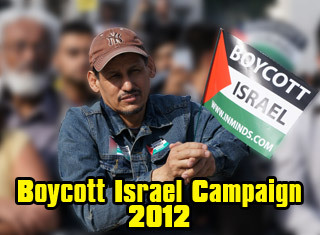 We will also be demanding that G4S end their complicity in Israel's war crimes. Fathia Khanfar is currently caged at the notorious HaSharon womens prison in Israel. At HaSharon prison Palestinian women prisoners have to endure beatings, insults, threats, sexually explicit harassment and sexual violence, and humiliation at the hands of Israeli guards. They are often forced to undergo degrading strip searches during the middle of the night - forced to squat naked and subjected to intrusive internal body searches, for no reason other than as a punitive measure. Women have been beaten and left tied to their bed for a day and a half and not allowed to go to the toilet as punishment for spilling water. The British security contractor provides and maintains the security systems at HaSharon prison, including the central control room.